This year’s United Nations climate summit will have a carbon footprint equivalent to the yearly electricity usage of more than 8,200 American households, according to the international body’s own figures. The U.N. estimates the summit, called COP24, will emit 55,000 metric tons of carbon dioxide — the very greenhouse gas U.N. officials are trying to keep from accumulating in the atmosphere. Based on U.S. Environmental Protection Agency figures, that’s the equivalent of more than 11,700 cars driving for one year or 728 tanker trucks worth of gasoline. That amount of CO2 emissions is also the same as 8,243 American homes for an entire year, according to EPA. However, that’s a low-ball estimate because it only includes the emissions from the conference itself, and not emissions associated with the thousands of people who flew to the meeting in Katowice, Poland. More than a few summit-goers, including celebrities, likely flew private jets. When those emissions are factored in, COP24’s carbon footprint is likely much higher, according to environmental economist Richard Tol. “(It is) probably unusually high as Katowice would require multiple stops for anyone who’s not from Europe,” Tol told The Daily Caller News Foundation. The high carbon footprint only contributes to the U.N.’s hypocritical image. Indeed, a former U.N. environment director was forced to resign in November over his extensive, costly travel while warning the world of the need to cut emissions to stem global warming. U.N. officials spent the past few months hyping COP24 as one of the last chances humanity has to avoid catastrophic global warming. A U.N. report issued in October suggested a $27,000 per ton carbon tax might be needed by the end of the century to stem warming. Tol also estimated COP24’s cost to top $130 million, but Tol considers that to be an underestimate because whole new facilities, basically a town, had to be built to accommodate tens of thousands of people. Do you think this is hypocritical?? 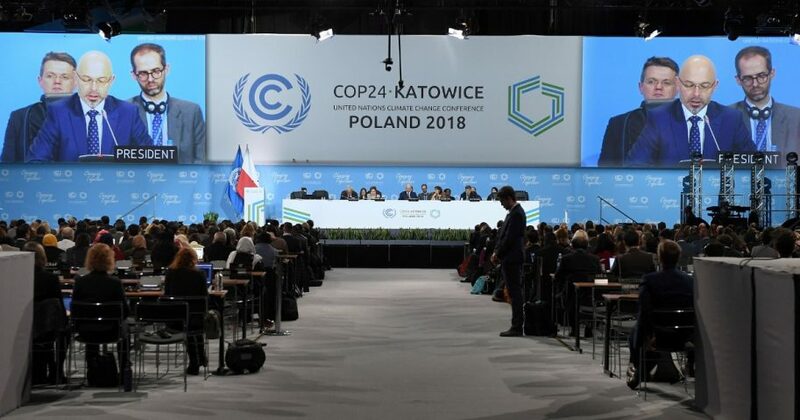 More than 30,000 people are expected to attend COP24, which kicked off Monday, in Poland. For 60 days, U.N. officials, diplomats, environmentalists and journalists will eat up electricity and fuel traversing thousands of square meters of temporary structures set up to house the summit. The summit’s goal is to further the implementation of the Paris climate accord, which went into effect in 2016. British natural historian and broadcaster Sir David Attenborough kicked off the summit with dire predictions of catastrophe is nothing is done to stop global warming. However, Attenborough, like thousands of others, no doubt emitted lots of carbon dioxide getting to Katowice, which is in the heart of Poland’s coal country. The U.N. has long been criticized for the high carbon footprints and costs of its meetings. The U.N.’s 2015 climate summit likely resulted in 300,000 tons of CO2 emissions, mostly from associated air travel. To deal with this hypocritical image, the U.N. has taken to offsetting the emissions from its summits by sponsoring forestry projects. For COP24, the U.N. will pay the Polish State Forests agency to plant 6 million trees. Carbon “offsets,” however, are somewhat controversial because they allow people to pay for theoretical emissions reductions by funding green energy projects or reforestation. The U.N. is also offering free lanyards to COP24 participants who buy offsets for non-conference-related emissions, which may include air travel based on how the U.N. calculates summit emissions. “Many will put that on their expense account, so this is cheap virtue,” Tol said. Tags: Climate Change, coal, energy, Europe, Facebook, Global Warming, Paris, Poland, Travel, Twitter, United Nations U.N.